Ronnie Antonius, founder and managing director of LEFT Consultancy has led this organization since 1996. LEFT Consultancy is a management consulting organization, specialized in health care management. Mr. Antonius is experienced in, health care policy formulation and health care planning. 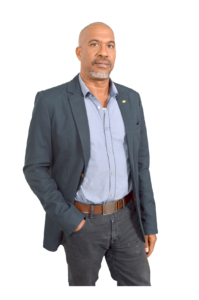 Ronnie is a qualified researcher in marketing and has completed many assignments in the fields of Management & Training, Organizational Strengthening, HIV/AIDS, Administrative Organization and Tourism. LEFT Consultancy developed quite a number of business plans and processes as well as organizational designs. Ronnie graduated from the Free University of Brussels in Health care science and since 2013, certified management consultant and member of the CICMC (Caribbean Institute for Certified Management Consultants). Antonius is also a board member of CICMC for the period 2016 – 2018. He is currently treasurer on the board of the IWGDS, the Institute for Women, Gender & Development Studies as well as secretary to the board of the “Lotjeshuis” a home for orphaned Children. Ronnie is married to Christel and has a son, Youssef.